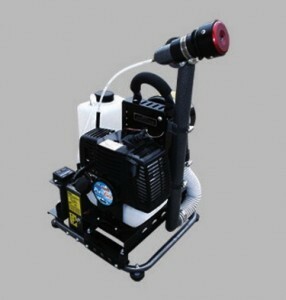 PRODUCT DESCRIPTION: The Mini Lite is a truck mountable, non thermal ULV fogger which is gas powered. Using a 2 cycle, 1.8 HP motor, the Mini Lite can deliver a flow rate up to 7 oz per minute. There is an included "remote control" to activate flow from your drivers seat so you can turn the mist on/off as you drive. The Mini Lite is the most powerful machine of its type for dispensing liquids in the 20 micron size and can be mounted on a tractor, atv or pick up truck. The formulation tank is 1.25 gallons and the gas tank is 33.3 oz. Made with high strength, welded steel tube, the unit weighs just 29 lbs (without tanks full) and measures just 15" wide, 15" long and 28" tall.